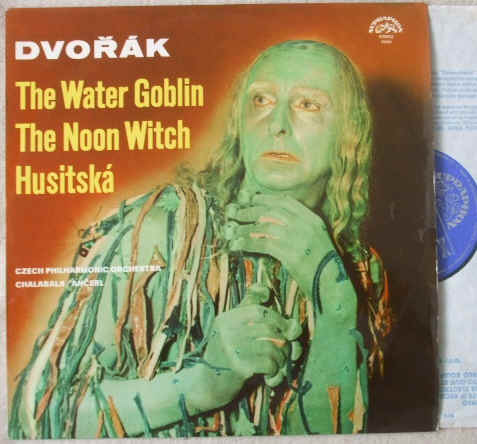 33rpm LP Record of DVORAK THE WATER GOBLIN NOON WITCH HUSITSKA, featuring the Czech Philharmonic Orchestra conducted by Zdenek Chalabala (Water Goblin & Noon Witch) and Karel Ancerl (Husitska). It was issued on the Stereo Supraphon blue and white label. Czech pressing. Catalogue number: SUA ST 50455. The record itself is graded excellent, with no discernible surface marks when viewed under normal house lighting. Play-tested on an AIWA turntable. Superb sound quality, with NO jumps, ticks, pops or crackle. Just about faultless. Minimal to no spindle wear. Labels clean. Light spider marks.